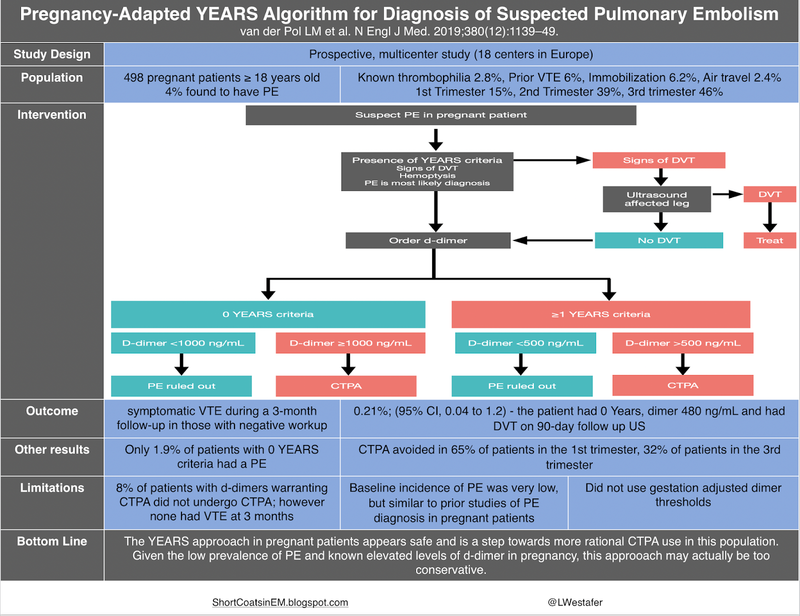 The Gist: Use of the YEARS algorithm in pregnant patients with possible pulmonary embolism (PE) appears safe and results in fewer computed tomographic pulmonary angiograms (CTPAs), particularly in low-prevalence testing environments . Given the natural course of d-dimer throughout pregnancy, gestation adjusted versions of this algorithm may better curb overtesting. Risk of ionizing radiation to the fetus. Risk of ionizing radiation to maternal breast tissue. Hormones during pregnancy thought to place pregnant patients at higher risk for venous thromboembolism. The d-dimer is known to increase throughout pregnancy making this test difficult to interpret or useless based on one's approach. A study by Murphy et al found a steady rise in median d-dimer values in healthy pregnant patients throughout pregnancy. This group found that the median d-dimer in pregnant patients crossed the threshold for non-pregnant patients prior to 20 weeks of gestation . Researchers are tackling this issue with various algorithms. In October 2018, Righini and colleagues published an algorithm rooted in the Geneva Score which would have resulted in fewer CTs. Now, van der Pol and colleagues have published the results of using the YEARS algorithm in pregnant patients. The article is summarized below but briefly, this protocol was implemented in ED and OB units at several centers in Europe and patients were followed up. The results demonstrated safety in this population with overall low prevalance of PE (4% overall). Notably, a standard YEARS approach to testing for PE in the pregnant patient results in imaging many patients for PE who do not have the disease in question due to the standard trajectory of d-dimer in a healthy pregnant patient. Additionally, the YEARS criteria represent a modified Wells criteria with the most commonly positive criteria being "PE is the most likely diagnosis." Many providers find this criterion frustrating. Future approaches may examine the effects of a gestation adjusted version of the YEARS algorithm. 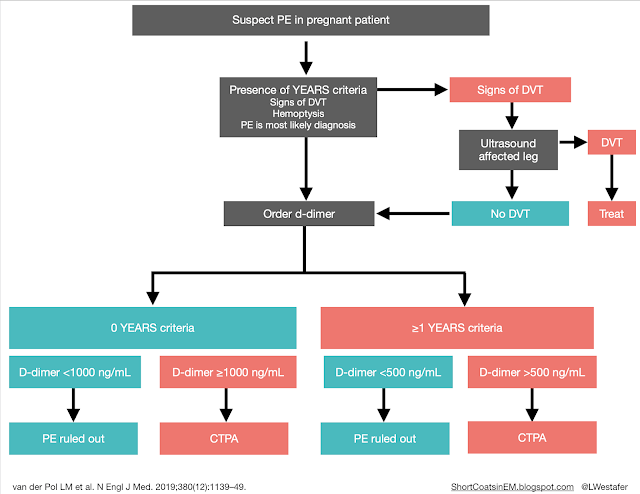 Yet, in the era of overtesting for PE in pregnant patients, use of this algorithm may reduce imaging in these patients. 1. van der Pol LM, Tromeur C, Bistervels IM, et al. 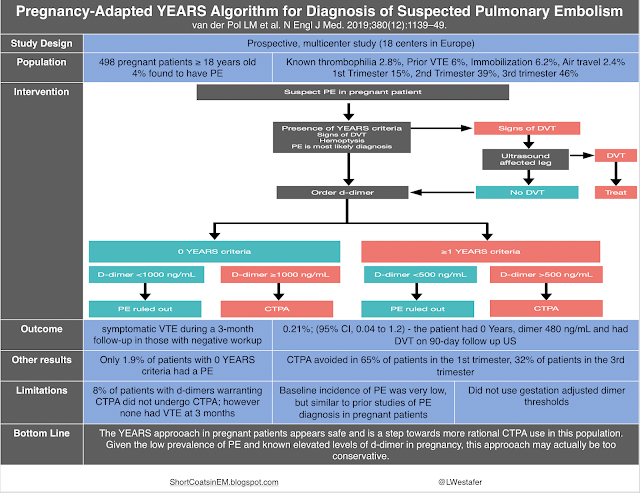 Pregnancy-Adapted YEARS Algorithm for Diagnosis of Suspected Pulmonary Embolism. N Engl J Med. 019;380(12):1139–49. 1. 2. Murphy N, Broadhurst D, Khashan A, Gilligan O, Kenny L, O ’donoghue K. Gestation-specific D-dimer reference ranges: a cross-sectional study. BJOG. 2015;122:395–400. 4. Kline J a, Richardson DM, Than MP, Penaloza A, Roy P-M. Systematic Review and Meta-analysis of Pregnant Patients Investigated for Suspected Pulmonary Embolism in the Emergency Department. Acad Emerg Med. 2014;21(9):949–59. Turn Your Back on the Rally Pack?! Disclaimer: This blog has NO medical advice & clinical info has been altered to preserve privacy. Simple theme. Powered by Blogger.